Effective States » “This will change the way you see economic growth” – Deals and Development book is available for open access! We’re thrilled to announce that Deals and Development, the book resulting from ESID research on the politics of growth is now available to order here and to download on open access here. This path breaking book is edited by three globally renowned ESID experts on the politics of economic development, Lant Pritchett, Kunal Sen and Eric Werker. The book advances a new conceptual framework for understanding how economic growth is ignited and maintained in a range of developing countries. 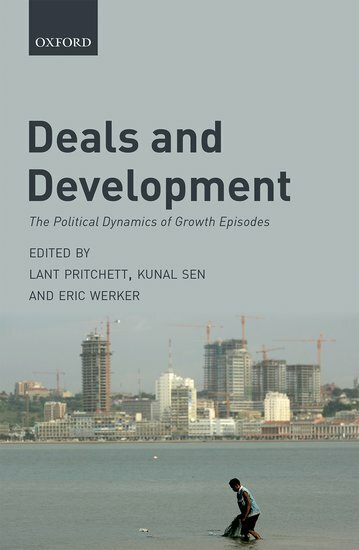 It investigates how relationships – “deals” – between political and economic actors explain why it is rare to see growth episodes being sustained in the developing world, and why developing countries have seen such differential success, both in igniting economic growth and in transforming growth accelerations into growth sustenance. Eleven chapters by ESID experts feature specific country examples across a wide spectrum of institutional and political contexts in Africa and Asia. Country cases range from Bangladesh to Cambodia, Malawi to India. The book is brilliantly useful in providing actionable levers to create reform and improve countries’ chances of bringing about transformative and sustainable economic growth.